Like his brother Kevin, Alan has a rich and varied cultural heritage. 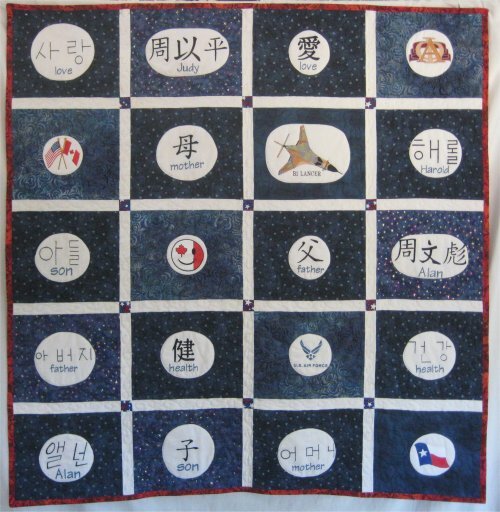 I wanted this quilt to reflect and incorporate all the different aspects of his heritage ... and my poor one brain cell is now completely fried. Alan's Dad, Harold is American: half Korean-half Caucasian & is part of the USAF. His Mom, Judy is Canadian, ethnic Chinese and belongs to the Alpha Phi college sorority. This Sanders family eventually settled in Texas, where Alan (and his brother) was born. The final quilt incorporates all these elements. 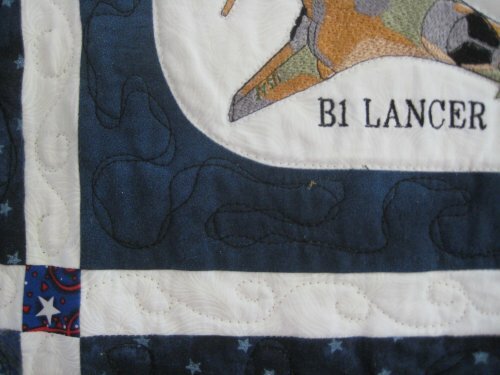 I wanted Alan's Heritage quilt to be different from Kevin's, yet both had the same items to be included. For Alan's quilt, I decided to frame each element by a different blue fabric and put all the blocks in a straight set layout with cornerstones in the sashing. 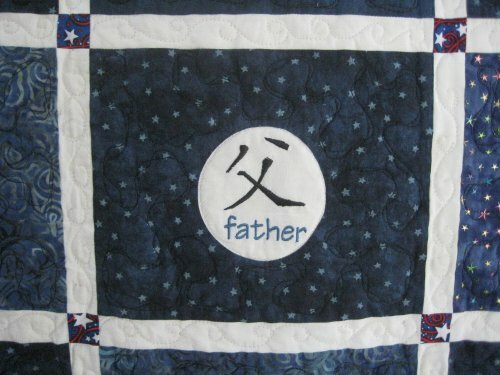 The words "love", "health", "father", "mother" and "son" are machine embroidered in Chinese, Korean and American English. There are pictures representing his mother: her sorority and a Canadian smiley face. There are pictures for his Dad's side: a B1 Lancer bomber and the Air Force emblem. There's a combination USA & Canadian flag to show the countries his parents were born in and the flag of Texas .. just for him! 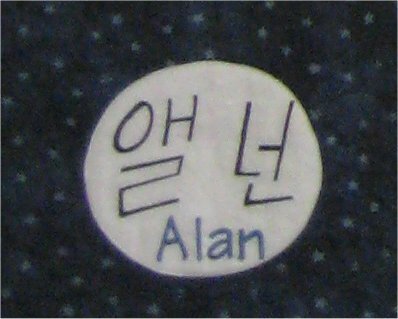 At my request, Alan's paternal grandmother wrote out Alan's name in Korean ... and that is what I digitized. This is something very special just for this quilt ... that's her printing! Then came the quilting decision. What do I do? Because the background fabric is so dark, anything intricate wouldn't show up unless I used a lighter thread. I'm just not that comfortable with my quilting, at this time, to bring attention to it! :-) What I eventually found was a designed called a "Ribbon Meander". It looks so fancy yet is incredibly easy to do ... any beginner quilter can do it. Initially, you do a standard meander .. a loose, big, wandering design that doesn't cross over itself. When you get to the end of your design area, you then deliberately retrace your original meander, but offset from the first path and, this time, you DO zigzag back and forth over the original stitching. The result looks like a twisted ribbon. Very pretty and visually more interesting than a plain meander.